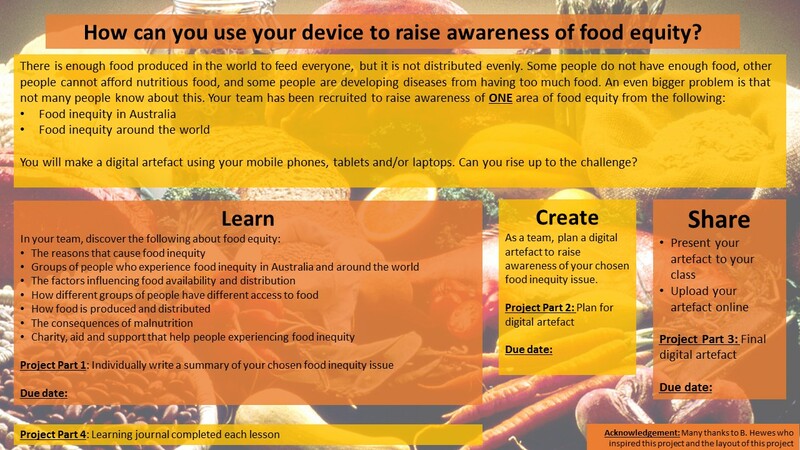 In Term 2 I will be supporting two year 9 food technology classes. In one class, I have basically been given free rein to run a project that will involve students using their own devices. This is the draft project outline so far. Any feedback will be welcome. Thank you to Simon Harper and Bianca Hewes for their help and inspiration so far. I changed the settings on the document from private to public. Can you see it now? Looks good Alice. I am doing a subject at uni where we have to make a digital artefact for our assignment. We are working in groups and I think http://cooltoolsforschools.wikispaces.com is useful. I am certainly finding it tricky to meet the brief for uni but it is more fun than straight out academic writing. Hi Jenny. Hope you are enjoying your school. Creating digital artefacts is certainly more fun than academic essays!